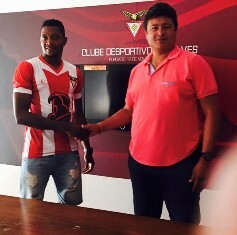 Former Nigeria U23 central defender Emmanuel Ibok Edet has put pen to paper on a 12 months deal with Portuguese Segunda Liga side Desportivo das Aves. The defender spent the last two seasons in Malta, first representing Floriana before crossing over to Naxxar Lions . Former Portugal international Abel Xavier specially requested that the fair skinned man be signed by the club and he is glad that he got his wish. Prior to his move to the Island Nation, he was on the books of Spanish side Atlético Baleares alongside Super Eagles midfielder Raheem Lawal. For the upcoming season, Emmanuel Edet Ibok has been handed the number 44 kit.